“Autism is not a tragedy. 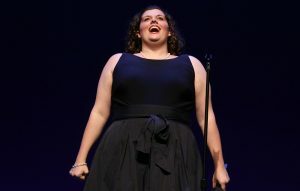 Ignorance is the tragedy.” This was the message Autism Speaks staffer and best-selling author Kerry Magro delivered to a cheering crowd at the first ever Arts for Autism Benefit Concert on Monday, June 20th, held at the Gershwin Theatre. 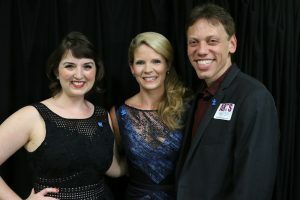 The evening, hosted by Tony-award-winning Broadway star Kelli O’Hara, was a celebration of how profoundly the arts can impact all students, and students on the Autism Spectrum in particular. Broadway’s finest shared the spotlight with theater students from schools around the country to sing messages of hope, joy, and inspiration. Students on the spectrum got the chance to share their stories on the Broadway stage. And if that were not celebration enough, the event raised over $36,000 for Autism Speaks. O’Hara’s warmth and vivacity set the tone for the evening as she opened up about her personal connection to the cause. Having watched her best friend raise a son on the Autism Spectrum, O’Hara is particularly sensitive to the power of the arts to change lives. Her hopefulness, which culminated in her beautiful performance of “Make Someone Happy,” captured the spirit of the night. Backstage, O’Hara emphasized the importance of an arts education, and the power to give a voice to those who don’t feel they have a voice. Students from performance groups from across the country were abuzz backstage as they curled their hair and stretched in the dressing rooms usually reserved for the Broadway cast of Wicked. 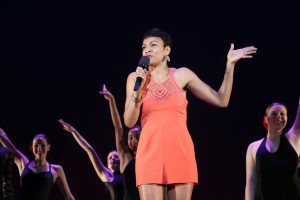 Educational Travel Adventures and Believe NYC produced the concert together, offering accomplished young performers the opportunity to sing and dance on a Broadway stage. Dominic Nolfi, from the original cast of Jersey Boys and a member of the Doo Wop Project, said a highlight of the evening was sharing the stage with a new generation. “I love performing with kids that are excited about theater – that’s exciting for me.” The feeling was mutual. Artistic Director Jacque Carnahan was inspired by how eagerly so many Broadway actors jumped at the opportunity to support this worthy cause. Their generosity of spirit modeled for a new generation of performers the importance of using their artistic expression to make the world a better place. 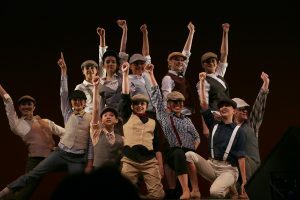 Directed by David Alpert, the concert featured actors from Pippin, Newsies, Side Show, and more. Favorite moments include a delightful mash-up from the cheerful Doo-Wop project, a soulful re-imagination of “Defying Gravity” sung by three of Broadway’s Elphabas, and a gripping rendition of “Falling Slowly” sung by Paul Alexander Nolan, Erikka Walsh, and danced by The Moving Youth Dance Company. The evening was full of joy, reflection, and inclusiveness. A true highlight of the night, however, was the Broadway debut of Gianna Hitsos. While her name is not one many audience members have heard before, her performance is one they are not likely to forget. Though Hitsos stopped speaking for a period of her life at age two, she found her voice again through her love of music. “Because I have music in my life,” says Hitsos, “I can conquer my dreams like everyone else.” It is tough to imagine there was a time when Hitsos could not speak given how beautifully she sings. Her riveting rendition of “Never Never Land” brought the audience to their feet. She is currently pursuing her dreams, studying music and theater at Gordon College in Massachusetts. The final number of the show, “If the World Only Knew,” was written by Scott Evan Davis in collaboration with the students of the P94m Spectrum School. One of those students, Russell Whitaker, spoke backstage about how the arts education he received in middle school helped him find his confidence, become more open and engaged, and even helped him become his class’s graduation speaker. The full company joined together on stage to perform this final number – proving that Autism doesn’t just speak – it sings. Emily Padgett & Erin Davie to join Arts for Autism! Arts for Autism announces the Doo Wop Project to the Stage!